・Ruger JP, Health and Social Justice. Lancet, 2004, 364: 1075-80. 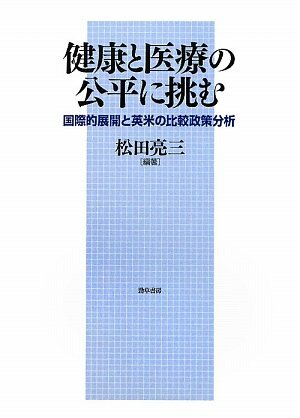 ・Ruger JP, Toward a Theory of a Right to Health: Capability and Incompletely Theorized Agreements. Yale Journal of Law and Humanities, 2006; 18: 273-326. ・A Oliver, Healey A, Le Grand J. Addressing health inequalities. The Lancet 2002; 360: 565-567. ・A Oliver, D Nutbeam, Addressing health inequalities in the UK： a case study. 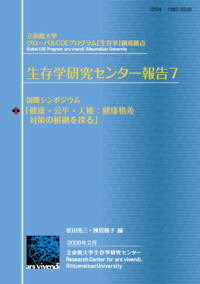 Journal of Public Health Medicine 2003; 25： 281-287. ・A Oliver, Prioritising health care: is ‘health’ always an appropriate maximand? Medical Decision Making 2004; 24: 272-280. Evans T, Whitehead M, Diderichsen F, Bhuiya A, and Wirth M, eds. (2001） Challenging Inequities in Health: From Ethics to Action. Oxford: Oxford University Press. Mackenbach JP (2006) Health Inequalities: Europe in Profile. An Independent, Expert Report Commissioned by the UK Presidency of the EU. UK Presidency of the EU. WHO (1999) Health 21: The Health for All Policy Framework for the European Region. Copenhagen: World health Organization Regional Office for Europe.